PixelHealer is a small but useful application that can help you revive dead pixels on your computer’s TFT or LCD display. The program doesn’t have an interface, but you can access its options via its system tray icon’s context menu. To find a dead pixel you can scan specific areas of the screen or directly specify its location on the monitor. 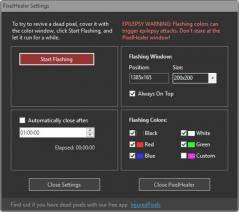 When using the first option you can open multiple windows and scan as many areas as needed to cover the entire display. For each window you open the app requires you to enter the position on the screen, choose the flashing colors that will be used for testing and repairing, as well as enter the window’s size (up to 500x500 px). Pixel Healer can also be set to automatically close after a specific time interval.